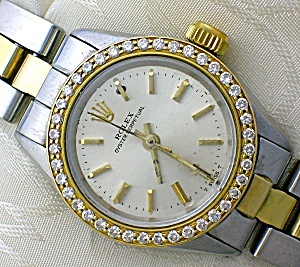 Ladies Stainless Steel and 18K Gold Diamond Face ROLEX Oyster Perpetual Wristwatch. 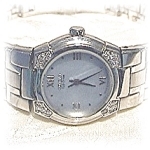 I have recently had this watch cleaned, and it is in Great condition. I have been wearing it, and it comes from my own collection. On one side of the back corner of the face is 490 and on the other corner 590. On both sides of the band strap are the numbers 78343. At one time I was told the face with the diamonds is original and worth $2000.00 alone. At the bottom of the face it has T Swiss T. The Band has the Rolex name on it.